It is important for the staff of an industrial plant to pay close attention to alarms broadcasted via speakers or sirens in order to respond appropriately in case of an emergency (e.g. fire, gas alarm). 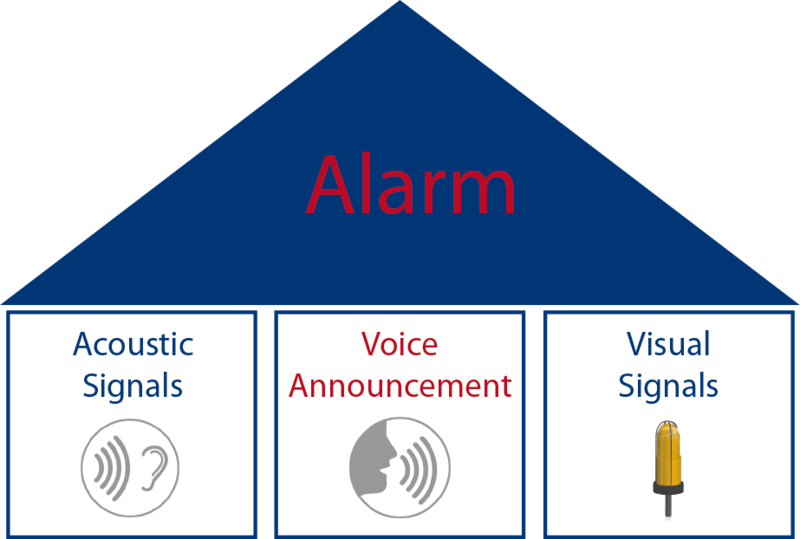 Alarms usually consist of three pillars: acoustic signals, voice announcements, and visual signals. 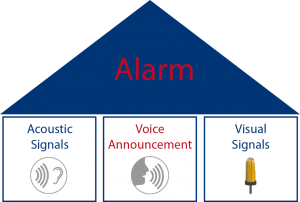 Acoustic signals notify people of an emergency without giving additional information. This can be a short tone sequence which is played back prior to a voice announcement. The effect is that listeners focus on the announcement and suspend conversations or current activities. In several industries (e.g. chemical plants), there are tone sequences for particular emergency situations specified by the plant operator due to standards or local legislation. When these acoustic signals (e.g. evacuation tone or fire alarm tone) are played back, emergency-trained staff immediately recognizes them and knows how to react. Click on the Play button to listen to a fire alarm tone example. Voice announcements or voice messages can give precise and immediate information tailored to the type of emergency and your environment. They instruct people on how to respond appropriately in an urgent situation. (Example: “Attention! Attention! Fire detected on Floor A! Please keep calm and leave the building immediately. Go directly to the assembly point. Do not use the elevator.”). Listening to a human voice telling you what to do can also have a calming effect on people in emergency situations. Voice announcements must inform people quickly and must be clear, concise and easy to understand for everyone. Hence, good audibility and sound level are very important. Visual signals are usually flashing warning beacons which can be used as additional indicators of an alarm, especially in areas with high ambient noise levels. Combining all three pillars described above in industrial environments is a good way to cover different local conditions. A pre-announcement tone which sounds familiar to the staff can attract the attention to the voice message which comes afterwards and which contains specific instructions. A flashing warning beacon is also helpful as a visual indicator of an alarm if the staff works in very loud environments. INDUSTRONIC offers excellent audibility of acoustic tones and voice announcements even in extremely loud environments. Customized texts or tones can be pre-recorded and stored on our digital audio processor (DAP). You can configure them so that they are automatically played back in a particular case of emergency. A CD-ROM with various tone examples can be ordered from INDUSTRONIC. We also provide a wide range of flashing warning beacons with various lens colors and light options, also for use in potentially explosive areas. If you have any questions regarding this topic or our product portfolio, please feel free to contact us.